The 2017 Edible Books Contest was held Wednesday, April 12 in the Markosian Library at Taylorsville Redwood Campus. 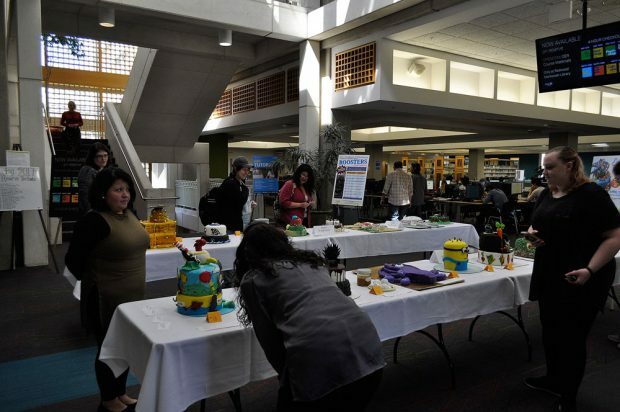 The library invited Salt Lake Community College students and employees to bake cakes in honor of their favorite book or character. The annual competition allows participants to showcase their culinary skills in a fun and creative way. A panel of judges evaluated entries in four categories: most artistic, most edible, most humorous and most literary. A fifth People’s Choice award was selected by the public. While most contestants came from the Culinary Arts Institute, all current SLCC students and employees were eligible to participate. Contestants submitted their entries on the day of the competition and registered on site. 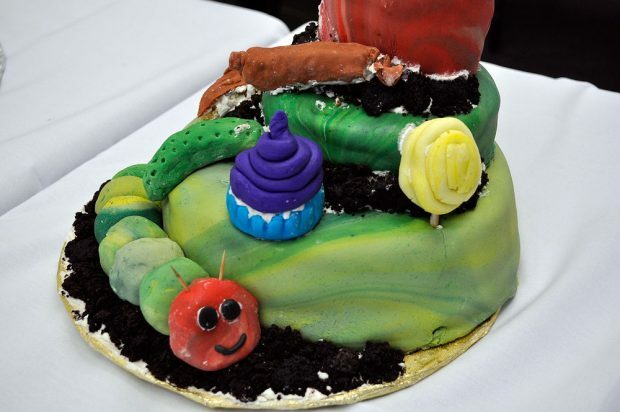 The rules of the contest were simple: cakes had to be entirely edible and completely handmade — no store-bought cakes that were decorated at home. Library employee Krystal Rose entered the contest again this year, using the popular children’s book “How to Eat Fried Worms” as her theme. Rose won the Most Humorous award in 2015 and says baking has become a therapeutic activity for her. Rose says the creativity that other contestants demonstrate with their entries is her favorite part of the competition. She also says the contest usually has a good turnout because people tend to gather there more than other places on campus. Culinary arts student Derek Wayman entered the competition as part of a graded assignment. Wayman says he thought about children’s books and characters that made an impact on his own childhood as a source of inspiration. He ultimately chose Totoro from the animated film “My Neighbor Totoro,” which was also adapted into a series of picture books. Wayman says that one day, when he has children, he would like to be able to make a cake for them and sees his entry as practice for the future. View close-up photos of the prize-winning cakes from the 2017 Edible Book Contest. Diana Maudsley, who is also studying culinary arts, won the People’s Choice award for the second year in a row, this time for her “Dr. Seuss” cake. She used candy melts with a printed stencil on top for the decorations on her cake. Maudsley started baking cakes just before the contest, when she made a baby shower cake for a cousin. She says her favorite part of the competition is ability to create. She also plans to participate in a cupcake competition later this year. SLCC Libraries instruction and liaison librarian Jamie Dwyer spearheaded the competition this year. She says the library holds the event to celebrate National Library Week and bring more interest to campus libraries. Check the SLCC Calendar for more events happening around campus.